No. 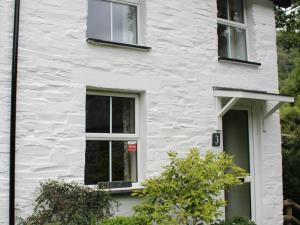 3 Dulas Cottages07740519080work Self-cateringNumber 3 Dulas Cottages is a one-bedroom self-catering holiday cottage set in the village of Ceinws, also known as Esgairgeiliog, in Powys. It is just a few miles from the historic mid-Wales market town Machynlleth in the Dyfi Valley, and within walking distance of the Centre for Alternative Technology (CAT). With Snowdonia to the north, and an attractive coastline just 20 minutes away by car, it's a comfortable and affordable base for your holiday. The cottage offers one large bedroom with a double bed and a single 'guest bed'. The rest of the accommodation is open-plan, with a living room on the ground floor, and kitchen and bathroom to the rear. There is a wood burning stove in the living room, as well as electric heating. The property is fully double glazed but with original features like a beamed ceiling and slate flooring retained where possible. Our south-facing aspect catches the morning sun while the garden is edged by a stream (which joins the river Dulas on its way down to the Dyfi). Off-road parking is provided. Bed linen and towels provided. Number 3 Dulas Cottages is a one-bedroom self-catering holiday cottage set in the village of Ceinws, also known as Esgairgeiliog, in Powys. Start days and length of booking (minimum two nights) are flexible - please get in touch to discuss your requirements, if possible allowing at least three or four days before your intended arrival. By Car: The cottage is located at the centre of Ceinws village (also known as Esgairgeiliog), just across the bridge from our local village pub (Tafarn Dwynant). The village is just off the A487, surrounded by wooded hills and mountains, with the Cadair Idris mountain range in easy reach. The postcode is SY209HA. Bus & Rail: Machynlleth is four miles to the south, with a rail service, and there are bus routes to the village.